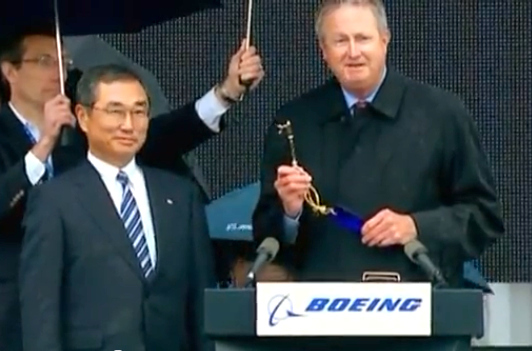 It’s been a long time coming but Boeing Commercial Airplanes chief executive Jim Albaugh has finally handed over the keys (actually it was one really big key) of the company’s first Boeing 787 Dreamliner passenger jet to president and CEO of All Nippon Airways, Shinichiro Ito. The ceremony took place on Sunday at a rainy Paine Field airport in Everett, Washington. The first of the ANA’s 55 Dreamliners will land at Tokyo’s Haneda airport on Wednesday local time. Around 800 787s have so far been ordered by airlines around the world. Boeing Commercial Airplanes chief Jim Albaugh hands a large key to ANA's Shinichiro Ito, signifying delivery of Boeing's first 787 Dreamliner jet. Issues concerning design and production meant that ANA had to wait three years longer than expected for delivery. 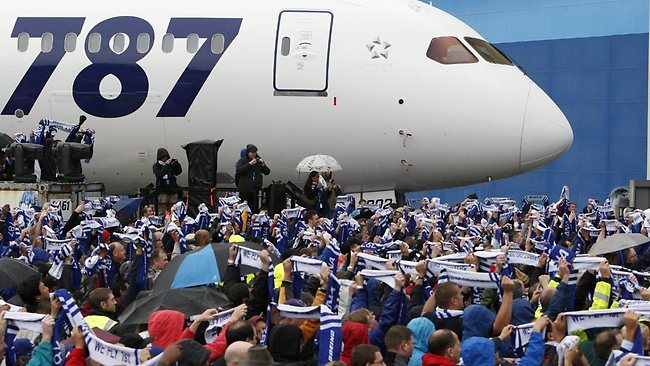 The Japanese airline will be hoping it has been worth the wait. The Dreamliner’s innovative design ensures extra comfort for passengers and much improved fuel efficiency. Whereas most passenger jets flying today have an aluminum skin, the Dreamliner’s is made of ultra-light but extremely strong carbon fiber. Its strength has made it possible to construct larger windows — 65 percent bigger than what regular planes have — so you should get a better view. Instead of pull-down shades, the new Boeing plane has incorporated electronic dimmers, so if you want to look out of the window while the person beside you is trying to get to sleep, you can lower the level of the light coming in to please both of you. One of the most fascinating claims Boeing has made about the new aircraft is that passengers won’t feel quite so rough after a long flight. This is apparently caused partly by the cabin being pressurized to an altitude of about 8,000 feet. The 787 will be pressurized to about 6,000 feet, so the idea is that your body won’t have so much difficulty in adjusting to conditions. Mood lighting should also help travelers feel more comfortable, and larger overhead bins should mean passengers won’t be fighting for space when storing hand luggage at the start of a flight. ANA will begin using the 787 on domestic routes from mid-November, with the first international route — Tokyo to Frankfurt in Germany — starting in January next year. The new Delicious is officially live – but will laziness kill it?